It’s Time D-Heads! 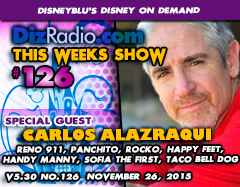 This week we celebrate Thanksgiving with all the things we are truly thankful for as we welcome CARLOS ALAZRAQUI (Reno 911, Rocko’s Modern, Sofia the First, Handy Manny, Phineas and Ferb, Fairly Odd Parents, Panchito in House of Mouse & the Parks, Book of Life, Inside Out, Happy Feet, Sheriff Callie, Taco Bell Dog, Stand Up Comedian) to the celebration! Carlos stops in and talks about his career, voice acting, Thanksgiving, family, projects, memories with Robin Williams and Elijah Wood, Taco Bell and so much more! In addition we have the D-Team back bringing Thanksgiving to the table as they stop in with thoughts on what they are truly Thankful for. In addition you have questions and thankfully Erin has the answers in I Want to Know. Caitlin brings us the latest from Walt Disney World with WDW-In-2, and Jason gives us a Blu-Ray and DVD we can be thankful for in The Vault. 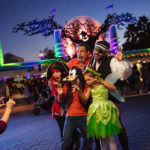 Nathan looks back at This Week in Disney History and Paige lends you an ear and gets musical in the Magical Music Review. And let’s not forget our digital side with Randy and Disney Multi-Media. 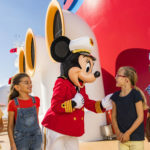 There is news hot off the D-Wire with information about Walt Disney World, Her Universe, The Force Awakens, the National Christmas Tree Lighting, Miss Piggy and the Muppets, Disney Music, The Disney Channel, The Good Dinosaur, Very Merry Christmas Celebration, Clothing, Toys, Epcot, the Magic Kingdom and more!